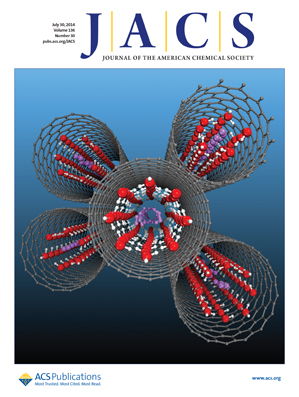 About the Cover: Molecular dynamics simulation of one-dimensional (1D) H2 hydrates: Here each ice polygonal nanotube (red-white balls) formed within a carbon nanotube (gray balls) traps a H2 wire (pink balls), contrary to conventional 3D H2 hydrates where one to two H2 molecules are trapped in isolated cages. Wenhui Zhao, Lu Wang, Jaeil Bai, Joseph S. Francisco and Xiao Cheng Zeng. 2014. Spontaneous Formation of One-Dimensional Hydrogen Gas Hydrate in Carbon Nanotubes. Journal of the American Chemical Society 136 (30), pp. 10661–10668. Xiao Cheng Zeng is Ameritas University Professor in the Department of Chemistry and professor in the Nebraska Center for Materials and Nanoscience. Joseph S. Francisco is dean of the College of Arts and Sciences. Jaeil Bai is research assistant professor of chemistry.